One of the ingredients I've been really into lately is peaches. I just can't get enough of them in any way, shape or form (see: this pie). So when I saw this recipe in one of my Cooking Light cookbooks, I knew I wanted to try it. I made some changes to the recipe to fit my time-frame and lifestyle, so if you want the original recipe just click the link below. The original calls for fresh peaches to be stewed in white wine for 30 minutes, then pureed and used as a marinade for the pork for at least 30 additional minutes before grilling -- but I just don't have that kind of time on a weeknight. Besides, I don't really want my toddler eating something that's been cooked in white wine, even if the alcohol has cooked out. I'm just not that progressive. So I used a plastic jar of peaches and skipped the first step all together, and marinated the pork in the mixture for about 20 minutes. And I was still very pleased with the end result. 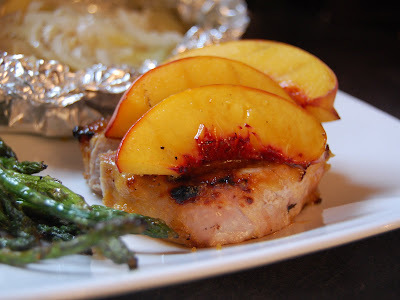 The peach marinade made the pork sweet and incredibly juicy, and the grilled peach slices on top really bumped up the fruity flavor. These grilled pork chops were delicious and summery, and this is something I would definitely make again. 1. Combine peaches, salt and black pepper, vinegar, maple syrup, chili powder, paprika, and red pepper in a food processor or blender; pulse to combine. Place half of peach mixture in a large heavy-duty zip-top plastic bag; reserve other half for basting. Add chops to bag; seal bag and refrigerate at least 20 minutes (up to 4 hours). 3. Remove pork from bag; discard marinade. Sprinkle pork with salt and black pepper. Place pork and peach quarters on grill rack coated with cooking spray, and grill 10 minutes or until the pork is done and the peaches are tender, turning once. Baste pork and peach slices with the reserved peach mixture every 2 minutes during the first 6 minutes of cooking. oh my gosh. it looks so yummy! I have to make this. I love your adaptations that turned this into a quick weeknight meal. Lovely dish, sounds so flavorful.